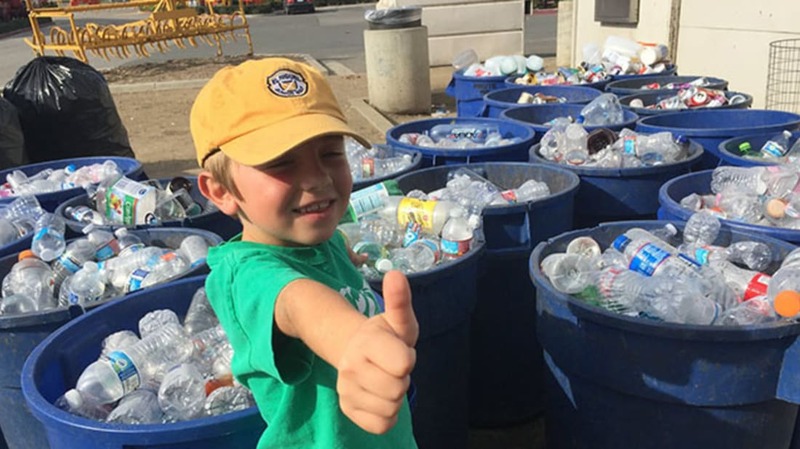 A 7-year-old boy in Orange County, California has quite literally turned trash into treasure: Ryan Hickman launched his own recycling business, and is saving his earnings for college, Distractify reports. The young entrepreneur’s inspiration for “Ryan’s Recycling” was fueled by a visit he and his father paid to a local recycling center when Ryan was 3 years old. When the toddler returned home, he and his mother distributed plastic bags among his neighbors so Ryan could collect and dispose of their cans and bottles, his website states. Friends, family members, and their co-workers soon joined in and, lo and behold, an entrepreneur was born. Ryan devotes a portion of his week to sorting and cleaning the bottles and cans he collects, and every few weeks, he takes them to the recycling plant. (Ryan's family lends a helping hand—and even more importantly, a car.) Over the years, his family thinks he’s recycled around 200,000 cans and bottles. He's also saved approximately $10,000 for college—although if Ryan had it his way, he says he would use the money to purchase his own garbage truck. For Ryan, recycling is a win-win situation: It helps the environment, plus you can earn some extra cash, he says. It’s hard to argue with that kind of logic. Ryan is “very passionate” about recycling, “and he likes to get everybody else passionate about it as well,” Ryan's mother, Andrea, told the Dispatch. “I think he’s rubbed off on all of us now. You find yourself walking past a can on the ground and needing to pick it up instead of walking away and leaving it there." Want to support Ryan’s Recycling? If you live in Orange County, you can schedule a pick-up online. If you don’t, Ryan’s Recycling T-shirts are available for purchase. They cost $13, and all proceeds are donated to the Pacific Marine Mammal Center in Laguna Beach, California, where Ryan serves as a youth ambassador. Get to know Ryan by watching the video below, filmed by his father.